Last week I talked about equitation and the fundamentals of rider position. This week I’m turning to the horse and taking a look at dressage funadamentals. Although a discipline in itself, dressage is not merely a style of riding but the basis of all riding. The show-jumper teaching her horse to balance and collect to squeeze an extra stride into an awkward line of jumps; the cowboy training his reining horse to bring the haunches under for sliding stops and rollbacks; and the knight using half-passes to manoeuvre in battle are all practising dressage. 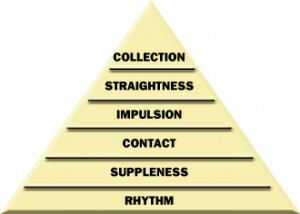 The training pyramid or the German training scale illustrates the sequence of qualities a horse must have in order to progress to the ultimate in equine athleticism. While the names of the levels sometimes vary, the order never does. You can’t teach collection to a horse that has no impulsion, and a horse must be supple before he can be truly straight. At the base of the scale is rhythm. This refers to the regular cadence of the footfalls in the three main gaits: four beats in the walk; two in the trot; and three with a pause for suspension in the canter (da-da-DUM, da-da-DUM). Obviously a horse who is lame will not have even gaits, but there are far more causes for lack of rhythm than unsoundness. A horse who is pokey and not responding to the leg will often fall out of rhythm into a sort of lazy four-beat canter or trot. A nervous horse will often speed up on the ‘scary’ side of the arena, then slow down on the safe side where her friends are. A stubborn horse may keep shifting the speed of his gait out of the pace the rider has asked for. All of these rhythm faults require different training methods to solve, but the first part of the solution is always rider awareness. What can you do? Even if you are a beginner rider and it’s not within your skills or mandate to fix a horse’s uneven pace you can be aware of it. Start by simply noticing the rhythm of footfalls within each gait. Can you count an even 1-2-3-4 in the walk, or is your horse shuffling or sidling? In the trot is the 1-2 rhythm clear and crisp or can you hear or feel ‘echoes’ of one foot coming down slightly after the other? Does your horse speed up or slow down? Once you’ve noticed the gait, see if you can improve it. This doesn’t have to be huge. A little more leg to keep the trot even and forward, or soft half-halts to steady a rushing horse. Once your horse responds and alters her rhythm for you, even if it’s only for a few strides, reward her immediately by softening your cues. Congratulations! You have just advanced your horse’s training. By focussing on rhythm for a few minutes during warm-up every time you ride you will soon see an improvement in the evenness of your horse’s gaits and in your own awareness of rhythm. This entry was posted in Blog, Cavaliere Archives. Bookmark the permalink. Find the latest installment of Allaigna’s Song: Aria in Pulp Literature.